Hammuriyeh (Syria) (AFP) – Aid agencies postponed a convoy of vital food and health supplies to Eastern Ghouta on Thursday, as the Syrian regime pressed a relentless ground and air assault against the rebel enclave. 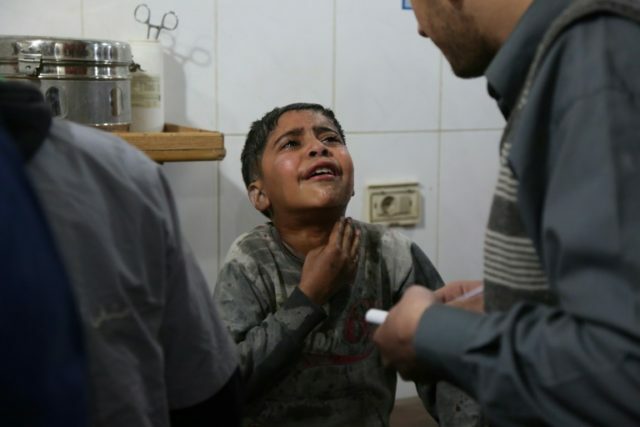 Dozens of people, including many children, were treated overnight for breathing problems and symptoms that medics said were consistent with chlorine attacks, which Western powers have repeatedly warned would not go unpunished. New air strikes on the town of Zamalka killed at least seven civilians, according to the Syrian Observatory for Human Rights, bringing the total number of dead in the offensive to more than 900. The aid trucks were meant to bring relief to war-weary civilians living under government siege for five years and now facing a deadly Russian-backed assault. But with bombardment continuing, a joint convoy between the United Nations, International Committee of the Red Cross and Syrian Arab Red Crescent planned for Thursday could not go through. “The convoy for today is postponed, as the situation is evolving on the ground, which doesn’t allow us to carry out the operation in such conditions,” ICRC spokeswoman Ingy Sedky told AFP. Ghouta is home to around 400,000 people under siege and is the last opposition-controlled zone on the capital’s outskirts. The Syrian army and allied militias began a fierce bombing campaign on February 18 against Ghouta, followed by a ground offensive. The campaign has so far recaptured half of rebel-held territory, according to the Observatory, a Britain-based monitor. Towns and villages have fallen in quick succession in recent days, with regime forces on the verge of cutting the remaining rebel-held territory into two isolated pockets. AFP’s correspondent in the town of Hammuriyeh saw motionless bodies lying in the streets on Thursday after a night of ferocious bombing. On Wednesday, volunteers from the civil defence group known as the “White Helmets” were seen trying to douse flames burning two men lying dead on the street next to a motorbike after a strike. Dozens of civilians were treated in the town for breathing difficulties late Wednesday, with medics reporting symptoms consistent with a toxic attack. Doctors at one facility treated at least 29 patients with signs of exposure to chlorine, according to the Syrian American Medical Society (SAMS), which supports hospitals in Eastern Ghouta. It said victims were suffering from shortness of breath, wheezing, and redness of the eyes. Several families were seen trying to reach fresh air late Wednesday on the roof of a four-storey building in Hammuriyeh, after air strikes on their neighbourhood. Parents had stripped their children down and were spraying them with water, fearing toxic substances had been absorbed into their clothes. “I’m going to suffocate,” two children screamed as rescue workers carried them down from the roof for treatment. Regime forces have been repeatedly accused of using chlorine on Eastern Ghouta in recent weeks, which both the government and Russia have staunchly denied. Government troops have imposed a siege on Eastern Ghouta since 2013, and deliveries of food and medicine to the zone require permission from all warring sides. The UN’s humanitarian coordination office (OCHA) in Damascus told AFP the convoy could not go through Thursday because it had not received permission from Syrian authorities. “Today, the UN and partners were not able to return to Douma in east Ghouta because the movement of the convoy was not authorised by the Syrian authorities due to security reasons,” said spokeswoman Linda Tom. The UN Security Council on February 24 demanded a 30-day cessation of hostilities but the resolution has done little to bring relief to civilians. Bombardment has continued and on Monday a long-awaited aid delivery was cut short after heavy air strikes. Nearly half of the food aid on the trucks could not be delivered, and the UN said Syrian authorities removed some medical and health supplies from the trucks. The UN’s top body met behind closed doors on Wednesday for three hours in an attempt to shore up the ceasefire. UN peace envoy Staffan de Mistura briefed the meeting and offered to help broker a deal with Russia to allow fighters in Eastern Ghouta to leave, a diplomat said. Rebel groups operating in Eastern Ghouta have so far refused to discuss evacuating the enclave and have been firing rockets and artillery into eastern areas of Damascus in recent weeks, leaving at least 32 dead according to the Observatory.